Dino Dig Game for birthday party! 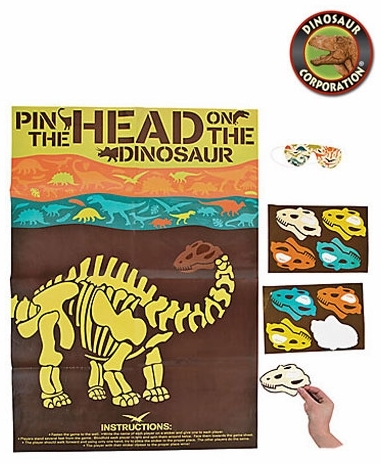 Pin the head on the dinosaur! This dino-mite party game guarantees a roaring good time when you include it in your dinosaur party supplies. It's a great birthday party activity, or add it to your classroom supplies as a special reward for your students when they finish learning about the prehistoric era. * Includes one 24 1/2" x 37 1/2" poster, two 10 1/2" x 7 1/2" sheets of dino head stickers with space for name and one 6" x 2 1/2" paper blindfold.